An easy method for making chili cheese dogs in the oven. What had happened was… we were having hot dogs for supper last night and everyone wanted them with chili and cheese. The problem with chili cheese dogs is that no matter how hot you get the chili, that cheese isn't going to melt unless you pop the dog in the microwave – which I hate to do because the bun gets weird. And since errybody wanted chili and cheese last night I would have had to run a nuke marathon to get them all ready. So I thought, well, I could just assemble everything in a baking dish, cover it with foil and heat it up in the oven and that way I won’t have to steam the buns, heat the chili or nuke the cheese AND I can just set the whole dish on the table and everyone can grab their own instead of me having to prepare everyone’s separately and then get up and do it again when everyone wants seconds. I thought I was a genius for about two seconds until I realized I was about to do the very thing I’d turned my nose up to on Pinterest. I have serious flaws, y'all. But I own them. I own them and dance with them. And while I usually have a pint of my homemade chili sauce in the freezer, I knew I was out and grabbed a can of Hormel no-bean chili at The Pig just to make life easier. And, I can’t even lie… that mess was actually pretty good. Don’t tell anybody I said that. Pop the hot dogs on a plate and heat in the microwave for about 1-2 minutes or until heated through. Assemble hot dogs in buns and place in a 13x9 baking dish. Spoon chili evenly over hot dogs then top with cheese. Cover dish with aluminum foil (tenting if necessary to keep the foil from touching the hot dogs) and bake at 350 degrees for 15-18 minutes or until cheese is melted. Uncover and serve. this is an awesome idea. Thanks for sharing. I'm drooling! Love the idea of baking them so the bun doesn't get weird! Sounds good!! Think I will try next time I make hot dogs. Do the buns not dry out??? Looks so yummy!!! No, not at all! The steam a bit under the foil. My name is Michael Richmond, I'm a red-neck. I'm making these tomorrow. OMG!!! That sounds even better!!! Give that smokey taste & smell!!! Yummy... gonna try it tonight..
We LOVE this! Ours are called Oven Chili Dogs, and inside the bun we do mustard and relish, and on top of the cheese, chopped onions...girl, I am telling you, it adds this different element to the dish! It'll make you swoon!!!!!!!!!!!! Thanks for sharing at Weekend Potluck! I think it would be good with the beans as well. Such a great idea! Thanks so much for sharing at Weekend Potluck. Gonna try for my husband, he LOVES chili-chz dogs!! yes we do this. way better! definitely be trying these. i have been baking dogs in the oven for over 20 years. i make pizza dogs. about a tbsp of pizza sauce on each dog with cheese. then bake in oven. you can add pepperoni or pineapple. also dash some Italian seasoning on before baking. seems to me the hot dog wouldn't need to be microwaved first?? don't they heat up enough during 15-18min cook time?? I wouldn't think so, no. But feel free to try it and let us know! I have made this recipe several times and each time we think, why haven't we thought of doing hotdogs this way before. There are only two of us so I make the whole bunch of hotdogs and buns then freeze what we don't eat in two's. Last night the "Joe" wanted hotdogs and he got his special treat right out of the freezer and hot out of the oven. What a good idea! my honey loves chili cheese dogs. Me, I'm not so crazy about them- but this looks really good so I'm going to try this and surprise him! Think I'll use cheese hot dogs or the nacho cheese ones if I can find them :) Thanks! This is the way I've eaten them since I was a kid at home! Yes, cooking them in the oven, the hot dogs do get hot enough. I like to add chopped onions before putting the cheese on top. Mmm...mmm....good eats! ! ! My family has made them for over 30 years. Same here Scott. There is no other way lol. I just made this with my homemade chili. Includes beans, and it came out great. New advice, though. Bottom of my buns came out with a bit of a crunch to them. Suggestions? I'm not a fan of crispy buns lol. Mine had the teensiest tiniest bit of a crunch too but I didn't mind. Placing your pan on the highest rack in your oven should take care of that next time if you'd prefer them to be soft. If you warm your chili up before you put it on the dogs then you can just use the broiler in the oven to melt the cheese and the buns won't get crispy. I also boil the dogs first. boil first for plump - and oven crisp them to a snap. Food Truck secret! We do this too!! My kids LOVE them served with baked beans and deviled eggs. I grill jalapenos and onions to top DH and the kids like french fried onions on theirs!! Sooooo yummy. Nutshel, how did you heat them after they had been frozen? I have been doing this for close to 30 years....my son knows no other way and he is 31 lol. I boil the dogs and then heat the chili and pour it over the top of the dogs and I SMOTHER the top with cheese. 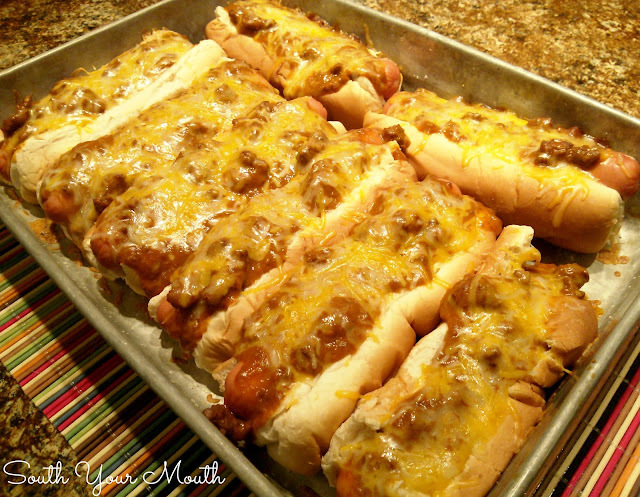 I don't bother with foil, just throw it in the oven with the broiler on til the cheese melts and voila...yummy chili cheese dogs. I've tried these multiple times. I LOVE this recipe! Thanks for sharing.